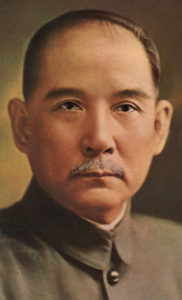 In 1911 many Edmonton Chinese went to Lethbridge, Calgary, or Winnipeg to see revolutionary leader Dr. Sun Yat-Sen, who was trying to raise support for China’s independence, democracy, and a better standard of living. Sun promised that a new Republic of China would advocate with Canada for fairer laws for Canadian Chinese. People across the Prairies raised $35,000 (equivalent to $1 million today). Sun’s Edmonton connection is Moishe “Two-Gun” Cohen, a swashbuckling Jewish East Londoner remittance man who, in 1909 Saskatoon, saved the life of Mah Sam, a restaurateur and Sun follower. Cohen moved to Edmonton and became a wealthy real estate speculator and crony of the Mayor—with side interests in card games and election-fixing. 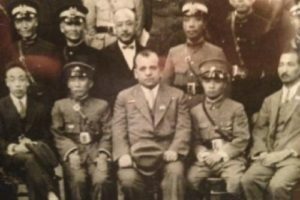 Cohen joined Sun in China in 1922 where he ran guns, spied, acted as a negotiator, and became a general with Chiang Kai-shek. Surviving as a POW of the Japanese in WWII, he retired to Montreal and wrote different versions of his exploits. The movie Gunrunner with Kevin Costner (1986) was inspired by Cohen. Two-Gun Cohen, in the white suite, seated with President Chiang Kai-Shek on his right.